I recently had the great privilege of speaking alongside Professor Muhammad Yunus, winner of the Nobel Peace Prize for his ground-breaking work in the creation of micro-finance. Among his many words of wisdom was a metaphor. He felt that those living in poverty, unable to gain the miniscule capital they needed to escape from servitude were bonsai trees. In other words, they had the potential to be the large trees that their DNA was inherently designed for, but instead they were only miniature forms of themselves. It struck me that Professor Yunus’s metaphor spoke to the very heart of Potentiology™, Bendelta’s approach to realising human potential, for the benefit of both the individual and their organisation. Many different kinds of tree can be made into a bonsai form, but the most common choice is the fig tree. Fig trees can be enormous, with a crown circumference that can reach up to 300m. Their potential is extraordinary. This same tree can be a tiny bonsai. This point is critical: there is no difference between the DNA of a giant fig tree and a tiny bonsai fig tree. Both had the potential to be massive. Only one achieved its potential. So, how does it end up as a bonsai? There are three elements to creating a bonsai, all of which reduce its potential. They are pot containment, crown pruning and root pruning. All three are metaphors for organisational cultures and leadership practices which reduce employees’ achievement of their potential and, as a result, reduce the performance of the organisation. All three are both more pervasive and more insidious than one might suspect. seen demonstrated, further reducing the likelihood of the person being given responsibilities reflecting their capability. This is not a question of how much work the person is given, but rather the level of significance and challenge of that work. Crown pruning. Crown pruning prevents the upward and outward growth of the tree. If someone is given very little opportunity to develop themselves – to play to their strengths, to discover their passions, to achieve mastery – then they will stay somewhere close to where they began. Trees typically seek to grow towards the sun; for employees, the sun may be personal and professional development, and it may also be a sense of working on something that comes from shared vision, something that they feel has real meaning and purpose. Organisations and leaders may also cause an employee to ‘prune their own crown’ if the environment feels unsafe – concerned by the price of failure, people may play it safe and thereby limit their own potential and their contribution to the company’s performance. Root pruning. Root pruning prevents the tree from reaching down into the soil, from anchoring itself and from finding the nutrients essential to its growth. There are many ways to starve an employee of nutrients. These include reducing the scope for collaboration with others or maintaining an environment of such non-stop production focus that they are unable to reflect, be creative or recharge. Again, what is remarkable about this is that the only difference between a bonsai and a massive tree is the barriers to growth that have been put in place. Without these barriers, and with sufficient nutrients and sunlight, that tree that looks so small, puny and twisted would become a giant. The giant and the bonsai are the same tree. They have just been cultivated differently. Human beings are the same. Central to Professor Yunus’ metaphor was his lived experience of the potential of people. He had seen that the same person who worked in servitude seemed so incapable could, with just a small amount of capital, become a highly successful entrepreneur, capable of supporting a family and transforming the economic prosperity of an entire village. Sadly, I’m sure we would all be at risk of looking at someone in that situation – perhaps one of poverty, illiteracy and indignity – and concluding that their potential is little more than their current situation, that the factors that had placed them in that situation had already massively reduced their potential. It turns out that we would be wrong. The same is true of all human beings. Each person has a massive reservoir of potential. Very few people get anywhere close to realising most of that potential. We, as leaders of the organisation employing them, cannot liberate all of that potential by ourselves. Some of those limits have come from personal backgrounds and factors that may be outside our reach. But we can still enable people to access vastly more potential than they are currently evincing. And when we do that, we not only benefit that person, we also improve the performance of the organisation and we improve the world as a whole. So, how do we do it? How do we enable people, individually and collectively, to become the giant tree they are capable of becoming, not a bonsai version of themselves? How do we do it in such a way that the performance of the organisation also greatly benefits? How to grow giants not bonsai? What does a larger pot look like? It looks like a quantum leap in scale on a key dimension. It’s the difference between busking on the street and playing in front of a stadium. It’s the difference between carrying a banner about gun control and instigating a national march about it. It could be much more reach, much more budget, much more strategic importance, or much more complexity. It’s the difference between a state-level initiative and a global one. It’s the difference between optimising a business model and creating a new one. It’s the difference between taking the notes at a meeting and leading a key part of the agenda. You can increase at least one dimension of any opportunity any time you like – opportunities to do so always abound. A larger pot is great. But a tree won’t grow to be a giant just because there is more room available. What most trees are doing when they grow is accessing more sunlight – either growing closer to it or expanding the amount of surface area of leaves to absorb the nutritious energies of the sun. Every leader can play a role in helping people become more resilient and resourceful. In some cases, it is about helping people build skills and practices that help them manage stress and bounce back from setbacks. In other cases, it is about modelling the way: taking work seriously but not solemnly; balancing hard work with time and energy dedicated to non-work activities; and showing an operating rhythm at work that achieves excellent results yet also includes time spent learning, reflecting, relaxing and connecting at a human level. For those of us addicted to working at a breakneck pace and not investing in our resilience, it is worth reflecting on what happens to trees with the tiniest, weakest roots. They are never the mightiest trees in the forest. What kind of trees are you growing? There are of course many species of tree and it is not for us to say which is best. The redwood is unsurpassed in terms of the height it can achieve, while a bristlecone pine can live for an incredible 5,000 years. A baobab is magnificent for its ability to store water, while bamboo and coconut palms are remarkable for their multitude of uses from every part of the tree. However, as a metaphor for successful organisations in the cyber-physical age, it is hard to go past the aspen. They grow in massive forests – or at least, so it seems. In fact, this is a clonal colony, and what looks like 10,000 trees may be only a single tree, sending up new shoots from the mass of roots under the grove. These are the most resilient trees in the word, with some colonies being at least 80,000 years old. Why is this so apposite for the cyber-physical age? Because the most powerful forces in human affairs are shared vision and collaboration. In the industrial age, we often compromised these strengths in the name of managerial efficiency. The great gift of 21st century technology is that this is no longer required and indeed, operating in this way is detrimental to the speed, agility and creativity now required for customer-centred business model innovation. What does today’s grove need to display? It needs to allow every tree to connect with each other. It needs to be inclusive and enjoy the incredible benefits of cognitive diversity. And it needs to have unfenced – increasingly, we are not talking about bounded organisations, but unbounded communities, that can link to customers, providers, partners and society. 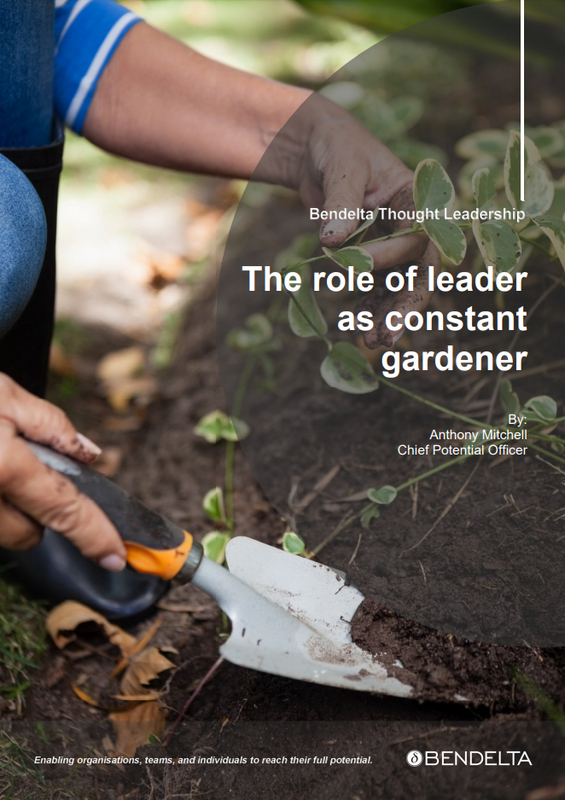 The role of today’s leader, then, is to be a constant gardener, tending to both individual trees and entire groves. For each person, we can practise pot expansion, crown encouragement and root extension. And for teams, organisations and communities, we can enable boundary-less collaboration fusing diverse perspectives for exponential breakthroughs. We can all look at our own behaviour and see where we are instead fostering bonsai development. With imagination and conscious choice, we can all be better gardeners. And when we are, the impossible becomes possible. Thank you, Professor Yunus, for living this metaphor and, by creating micro-finance and spreading it around the world, demonstrating how a leader, through his or her actions, can turn a desert into a garden that allows so much previously untapped potential to be seen in full bloom.